Dr. Royer is the president of Educational Help, Inc., the parent company of Reading Success Lab. He oversees general operations and also manages customer support. Born in Pocatello, Idaho, Dr. Royer grew up in Nevada and California and spent three and a half years after high school graduation in the United States Air Force, stationed in Frankfurt, Germany; Samsun, Turkey, and Wakkanai, Japan. He holds a bachelor’s degree in psychology from California State University, Chico, and a master’s degree in educational psychology and a Ph.D. in educational psychology from the University of Illinois at Champaign/Urbana. 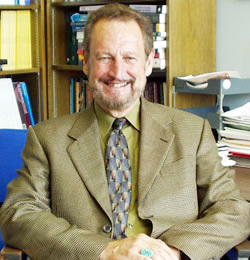 Dr. Royer began his career as an assistant professor in the Department of Psychology at the University of Massachusetts, Amherst, Massachusetts, in 1970 and retired as a full professor in 2007, maintaining an appointment as a research professor until 2012. He has had visiting faculty appointments at the University of Illinois, Arizona State University, South China Normal University in Guangzhou China, and Queensland University, and the University of New England in Australia. The author or editor of four books and over 70 journal articles and book chapters, Dr. Royer’s research has been recognized through his election to Fellow status in the Division of Educational Psychology and the Division of Experimental Psychology of the American Psychological Association. He has also served as president of the Division of Educational Psychology, a division of the American Psychological Association. Dr. Royer’s research has been supported by a series of grants from the National Science Foundation. He has been active in international literacy projects and has worked in Grenada, Haiti, Guatemala, Belize, Burkina Faso, Nigeria, India, Pakistan, and Indonesia. Dr. Royer’s international work has been supported by the United States Agency for International Development, the Swiss Development Corporation, and the World Bank.